There are a wide range of device platforms and app types. You might need to manage apps on both company devices and users' personal devices. You must ensure that your network and your data remain secure. Additionally, you might want to assign and manage apps on devices that are not enrolled with Intune. 1 Consider using Windows Information Protection to protect apps on devices that run Windows 10. 2 Applies to devices managed by Intune only. 3 Intune supports available apps from Managed Google Play store on Android Enterprise devices. 4 Intune does not provide installing a shortcut to an app as a web link on standard Android Enterprise devices. However, Web link support is provided for multi-app dedicated Android Enterprise devices. 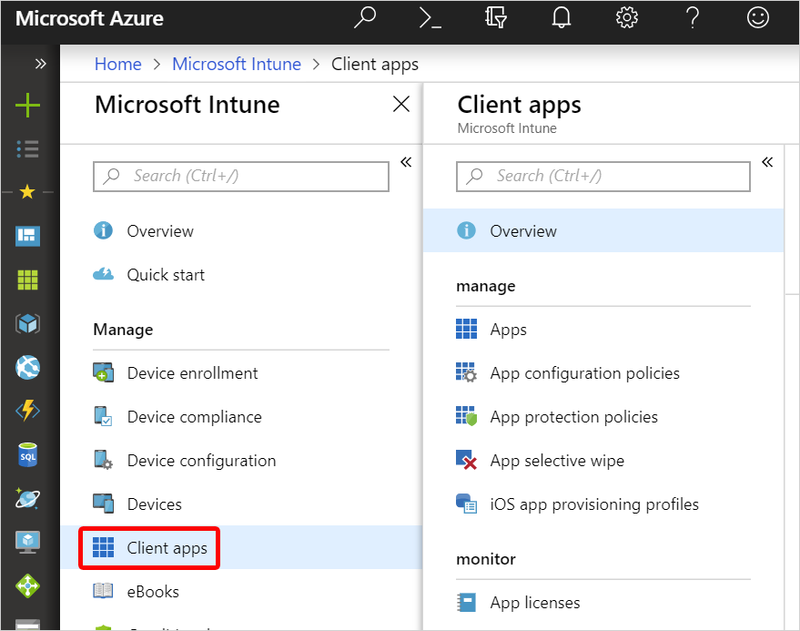 In the Microsoft Intune pane, select Client apps. The next four sections describe the options available in the Client apps pane. App configuration policies for Intune. For more information about this section, see Manage apps. iOS volume-purchased program (VPP) apps. Microsoft Store for Business volume-purchased apps. Discovered Apps: View apps that were assigned by Intune or installed on a device. For more information, see View device details with Microsoft Intune. App Install Status: View the status of an app assignment that you created. For more information, see Monitor app information and assignments with Microsoft Intune. App protection status: View the status of an app protection policy for a user that you select. Audit logs: View the Intune app-related activity of all IT admins. For more information about this section, see Monitor apps. Windows enterprise certificate: Apply or view the status of a code-signing certificate that's used to distribute line-of-business apps to your managed Windows devices. Windows Symantec certificate: Apply or view the status of a Symantec code-signing certificate, which is needed to distribute XAP and WP8.x appx files to Windows 10 Mobile devices. App categories: Add, pin, and delete app category names.